Sir Sidney Nolan OM AC - Brighton technical school, Victoria, Australia. SIR SIDNEY ROBERT NOLAN OM, AC. One of Australia’s best-known artists and printmakers, Sidney Nolan was born at 729 Drummond Street, North Carlton, an inner working-class suburb of Melbourne, on the 22nd. April, 1917. He was the eldest of four children born to Sidney Henry Nolan, Lorry Driver, aged 23 years, and his wife Dora Irene Nolan, formerly Sutherland, aged 22 years. Sidney Henry Nolan was born at Rushworth, and his wife Dora was born at Seymour, Victoria. Later, the Nolan family moved to the bayside suburb of St. Kilda. Sidney Robert Nolan attended the Brighton Road State School for his primary education, after which he attended the Brighton Technical School. Following his years at Brighton Technical School he enrolled at the Prahran Technical College, (now part of Swinburne University), Department of Design and Crafts, in a course which he had already begun part-time by correspondence. ​From 1933, at the age of 16, he began almost six years of work for Fayrefield Hats, Abbotsford, producing advertising and display stands with spray paint and dyes. From 1934 he attended night classes sporadically at the National Gallery of Victoria. Portrait of Sidney Nolan, 1964, by Axel Poignant. Source : National Portrait Gallery, Canberra, 2003.126. Years at Heide (1941 - 47). Sidney Nolan was a close friend of the arts patrons John and Sunday Reed, and is regarded as one of the leading figures of the so-called “Heide Circle”, (Bulleen, Victoria), that also included Albert Tucker, Joy Hester, (a former Brighton Technical School Student), Arthur Boyd and John Perceval. Boyd and Perceval were members of the Boyd artistic family who were centred at “Open Country”, Murrumbeena. At the Swedish Church, South Melbourne, on 16 December, 1939 he married his first wife, Elizabeth Paterson who had studied at the Gallery School of Painting, but his marriage soon broke up because of his increasing involvement with the Reeds. He joined the group publishing the journal “Angry Penguins” in the 1940s., after deserting from the Army (Citizen Military Forces), during World War II. Soon after the birth of Sidney and Elizabeth’s daughter, Amelda, in 1941, they separated, and later divorced. At “Heide”, Sunday Reed and Sidney Nolan became lovers. 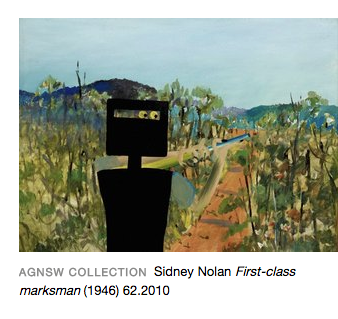 Sidney Nolan "First-class marksman". (1946) 62.2010. Source : Art Gallery of New South Wales. AUSTRALIAN MILITRY FORCES RECORD, NOLAN Sidney Robert. V206559. On the 7th. March, 1942, Sidney Robert Nolan signed his Mobilization Attestation Form at the Drill Hall, McWhae Ave., Ripponlea, Victoria. He was 24 years and 10 ½ months of age and his occupation was recorded as Artist. The Attestation Form records his next-of-kin was his wife Elizabeth Nolan who resided at 5 Smith Street, St. Kilda. His religion was Church of England and he had qualified at Intermediate level at secondary school. The Medical Examination report records that Sidney Robert Nolan’s fitness level was classified at “Class II, (Chest Condition)”. 22 April, 1942. Sidney Robert Nolan was posted from Rec. Camp to Seymour. 29 May, 1942. Transferred from 3 SP. Coy. to Ballarat. 4 November, 1942. Prom. A/Corporal. 24 November, 1942. To Musketry and Gas School, Hurstbridge. 9 February, 1943. Rank of Corporal confirmed. 18 August, 1943. Admitted, crushed fingers. 20 August, 1943. Evacuated to 108 A.G.H. Posted to X List. 23 September, 1943. Discharged to unit – Crushed Fingers. 23 September, 1943. Rejoined Unit from 108 A.G.H. Off X List. 9 November, 1943. Report of Injury at Ballarat – 18/8/1943. Crushing of distal part of 4th. & 5th. fingers of left hand. On Duty. No negligence or misconduct. Ballarat. 30 June, 1944. Admitted Dyspepsia. 5 July, 1944. Detained in 48 Aust. C. Hospital, more than 7 days. Transferred to X List. 19 July, 1944. Discharged to G.D.D. Vic. Class B1. Psychopathic Personality. Heidelberg. 20 July, 1944. Medical category assessed as B1 from A1. Watsonia. 20 July, 1944. G.D.D. March/In from 115 (H) M.H. for L.L.O.P. Royal Park. 20 July, 1944. March/Out on L.W.O.P. (leave without pay). 20 July, 1944. Transferred to Holding Strength. G.D.D. Vic. L. of C. whilst on L.W.O.P. Royal Park. Illegal Absentee List. Vic. L. of C. Area. Declared Illegal Absentee. 20 September, 1944. Investigation held at G.D.D. Royal Park. 21 June, 1946. Discharged. Misconduct during service. Discharge effected in absentia. Certificate not prepared. VVM2279. Declaration of Investigating Officer as to Illegal Absence. Unit 158 AUST. SUP. DEP. PL. attached to G.D.D. Royal Park. NOLAN Sidney Robert, No. 206559, CPL. 1/ That, pursuant to orders received from my Commanding Officer, I have faithfully investigated the alleged illegal absence of V206559 CPL NAYLOR, S.R. (sic.) (NOLAN), and now declare that the said member absented himself without leave at 0800 hours on the twentieth day of August, 1944, and that he is still absent. 2/ That I further report that the said member is deficient in the items mentioned in the schedule hereto. Total amount outstanding : £15-19-11d. SIDNEY ROBERT NOLAN. G.P.O. SYDNEY, NEW SOUTH WALES. Date commenced 15/4/42. Date of birth 22/4/17. 22 AUST. SUPPLY DEPOT COMPANY. Details of Certificate of Discharge 590330. Served in continuous Full Time War Service in the C.M.F. (Citizens Military Force), from 15/4/42 to 21/6/46, for a Total Effective Period of 827 days, which included Active Service in Australia 827 days. Discharged from the C.M.F. and discharge confirmed vide Schedule VVM2279 to take effect from 21/6/1946. Stamped 25 May, 1949. Central Army Records Office. (The Discharge Certificate is marked with a 12cm x 2 cm red stamp reading : “Discharged in Absentia for Misconduct. (Because of Illegal Absence)”. Sidney Nolan lived for some time at the Reed’s home, “Heide” outside Melbourne, (now the Heide Museum of Modern Art), where he painted the first of his famous iconic “Ned Kelly” series, reportedly with input from Sunday Reed. He also conducted an open affair with Sunday Reed at this time, although he married John Reed’s sister, Cynthia, in 1948, after Sunday refused to leave her husband. He had lived in a ménage à trois with the Reeds for several years and although he spoke to them, and visited “Heide” but once again in their lifetime, the years there together have been seen as a dominating factor in the subsequent lives of them all. 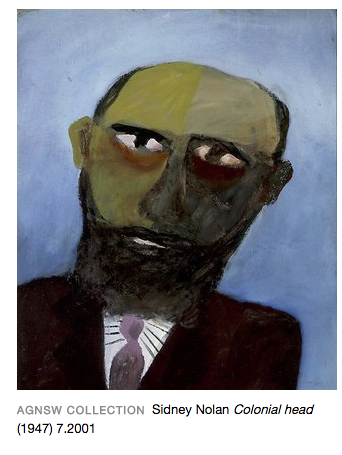 Sidney Nolan "Ned Kelly" (1955) 546.1987. Source : Art Gallery of New South Wales. ​In November, 1976, Cynthia Nolan ended her life by taking an overdose of sleeping pills in a London hotel. In 1978, Sidney Nolan married Mary, née Boyd (1926 – 2016), youngest within the Boyd family and previously married to John Perceval. Sidney Nolan painted a wide range of personal interpretations of historical and legendry figures, including explorers Burke and Wills and Eliza Fraser. Probably his most famous work is a series of stylized descriptions of the bushranger Ned Kelly in the Australian Outback. In 1951 Sidney Nolan moved to London, England. He travelled in Europe, spending a year in 1956 painting themes based on Greek Mythology while in Greece. In Paris he studied engraving and lithography with S. W. Hayter at Studio 17t, spending two years there. He was a prolific book cover illustrator, him images enhancing the dust jacket of over 70 publications. In 1965, he completed a large mural 20 metres by 3.6 metres depicting the 1854 Eureka Stockade, rendered in enameled jewellery on 1.5 tonnes of heavy gauge copper. At the register office, Westminister, London, on 20 January, 1978, Sidney Nolan married Mary Elizabeth A’Beckett Perceval, an artist. Mary was a sister of Arthur Boyd, and a daughter of the potter Merric Boyd. She had previously been married to John Perceval and had met Sidney at “Heide”. Sidney Nolan decided to remain overseas and bought “The Rodd”, a large manor on the Welsh border in 1983. His seventieth birthday in 1987 brought a flurry of celebratory media attention and events. Most notably, in June the National Gallery of Victoria opened its “SIDNEY NOLAN, Landscapes & Legends : A Retrospective Exhibition 1937 – 1987”, which later toured Sydney, Perth and Adelaide. Survived by his wife, Mary, Amelda and Jinx (the daughter of his second wife Cynthia), Sir Sidney Nolan died on the 27th. November, 1992 in Westminster Hospital, London, and was buried in Highgate Cemetery. Sidney Nolan "Colonial head". (1947) 7.2001. Source : Art Gallery of New South Wales. ​HONOURS BESTOWED ON SIDNEY ROBERT NOLAN. SIDNEY NOLAN Order of Merit (Imperial) 18 Nov. 1983. SIDNEY ROBERT NOLAN Knight Bachelor (Imperial) 13 June, 1981. BRIGHTON HISTORICAL SOCIETY, VICTORIA, AUSTRALIA. A Tribute to Sidney Nolan. The History of the Brighton Historical Society. The Brighton Historical Society was founded on the 2nd. October, 1963. Birth Certificate of Sidney Robert Nolan, 22nd. April, 1917. World War II Service Record. Sidney Robert Nolan. National Archives of Australia. “The Age” 14 February, 1987. Saturday Extra. Australian Dictionary of Biography. Nolan, Sir Sidney Robert (Sid) (1917 – 1992) by Nancy D. H. Underhill. Online. Wikipedia Online. Biography. 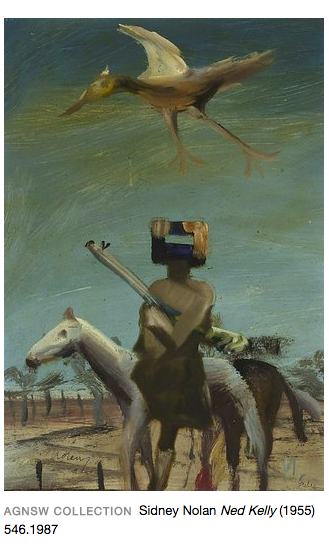 Sir Sidney Nolan. OM, AC. Australian Honours Search Facility. Australian Government. Department of the Prime Minister and Cabinet. Online. The Brighton Historical Society website. Victoria.